The best way to protect your child from progressive hearing loss is to equip them with a pair of headphones that limits in 85dB. The limit can be changed to 110dB when press and hold 3s on the pause/play button. Based on the advanced Bluetooth technology, it can compare with almost all Bluetooth devices, it also has wired mode to connect with devices which has 3.5 mm AUX. It also provides TF card slot and FM radio function. Your kids can wear the headphones when they are running, dancing and playing. Flexible headband brings easier sizing, fit perfectly and securely on your kids head, which they can wear all day without any discomfort. Foldable design makes it convenient carrying and storage. They are the best trip partner for your kids. Are you worried about how to give your kids a surprise at birthday, Children's day, Thanks giving day, school opening day, Christmas day? It is an awesome gift for your lovely children. They are designed for kids age over 3,fit for growing teens even adults. Made of durable material and soft earmuff, it provides comfortable using experience and long period using time. They are built to last and withstand the rough play of kids. We also provide 30 days 100% money back guarantee and 18 month quality warranties. Hearing Protection: MIDOLA kids' headsets protect your kids from hearing hurting when they play for a long time with 85dB of limited volume(the level the World Health Organization considers safer). These Volume Limited Headphones are suitable for toddlers and youth teens ages 3 and up. The volume can be switched from 85dB to 110dB or 110dB to 85dB when press and hold pause/play button 3 seconds. Multifunctional Bluetooth Headphones: 8 hrs playtime Bluetooth headphones(handsfreecalling) / TF card music player (Not including TF card) / FM radio /AUX-IN.Your little ones can listen anytime in both a wired and wireless capacity. The wireless design is handy for avoiding tangles,a favorite feature of the big-kid panelists. However, the cord is detachable,minimizing a toddler's risk of getting snagged,the volume reduction of wired headphones is also predictable(low than 85 dB). Comfortable and Collapsible Design: The adjustable headband gives the headphones some impressive flexibility, so they can adapt to the shape of your head for a perfect fit.Soft ear cushions and long-wearingcomfortable without stress,fit for growing teens even adults.It's your kid's great travel partner,let your little ones enjoy the journey without bothering you. High Compatible With Most Device: Standard 3.5mm audio jack suitable for listening to music or audiobooks. Quickly pairing with mostBluetooth devices device: for iPhone for iPad/ Android Cellphones/ PC and Tablets. Crystal stereo sound-40mm dividers,producehigh-quality sound,createan amazing experience. 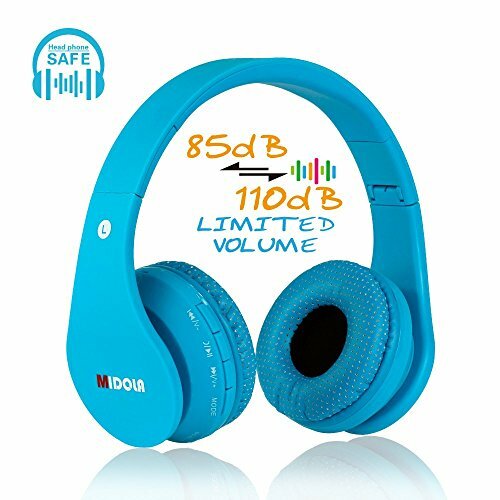 Ideal Gift Choice for Kids: It is designed for 3 years old and up children.Made of high quality, durable materials.Also, these headphones are built to last and withstand the rough play of kids. 30 days 100% money back guarantee,18-month replacement warranty,12-hour Customer-friendly Support Service. If you have any questions about this product by MIDOLA, contact us by completing and submitting the form below. If you are looking for a specif part number, please include it with your message.